Want to serve your community during the holidays? There are countless organizations and nonprofits near you that could use a helping hand. Browse our quick tips for ideas! Whether you’re volunteering with young kids or teens, it’s important to emphasize the purpose of service. Talk about intentions for volunteering, and how you can make sure that you are maximizing your service to better your community. Look into unique, adaptable volunteering opportunities, like putting together hygiene kits in your home or delivering Christmas gifts in underprivileged areas. Genius Tip: Check out how the Pasadena Jaycees deliver gifts with their Operation Santa initiative, along with an annual Thanksgiving food drive. 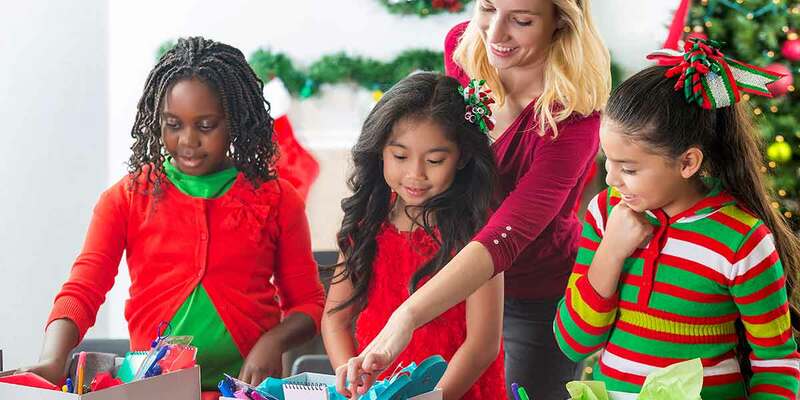 If your child’s school is looking for ways to raise money during the holidays, give them some ideas for preschool or elementary school fundraisers that the kids can get involved in. Decide whether ongoing community service ideas or a one-time event with an organization are best for your group. Nonprofits like Salvation Army organize seasonal volunteers to help with holiday projects such as the Angel Tree gift program or Give a Kid a Coat campaign. Use an online sign up to cover different needs at a women’s shelter or to schedule disaster relief donation shifts. Your church small group, PTA, book club or business can organize a food drive to benefit a local organization. Want to give back but not able to volunteer? Create a holiday fundraising campaign sign up and collect money to give directly to organizations raising support at the end of the year. It can sometimes feel overwhelming to find the right way to make a difference, but the most important step is to start. Go be the good, genius!